Citizens may provide input on the development, revision, and implementation of the SWMPP by calling City Hall @ 256-492-2414 or electronically by using the form provided on this page. Additionally reports of non-compliant construction sites, illicit discharges (including spills or illegal dumping), impaired waterways, and violations of ordinances should be reported by either method listed above. Select native plants and grasses that are drought- and pestresistant. Native plants require less water, fertilizer, and pesticides. Don’t overwater your lawn. Water during the cool times of the day, and don’t let water run of into the storm drain. Use hazardous substances like paints, solvents, and cleaners in the smallest amounts possible, and follow the directions on the label. Clean up spills immediately, and dispose of the waste safely. Store substances properly to avoid leaks and spills. Flush responsibly. Flushing household chemicals like paint, pesticides, oil, and antifreeze can destroy the biological treatment taking place in the system. Other items, such as diapers, paper towels, and cat litter, can clog the septic system and potentially damage components. 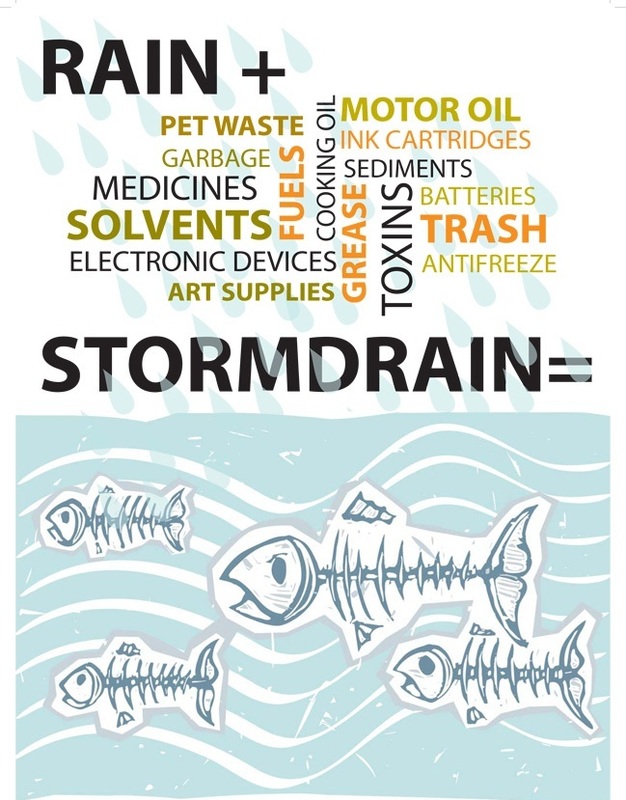 Storm drains connect to waterbodies!